Imagine a bioactive compound about to undergo a medchem-style optimization. Let’s say this molecule contains a heterocyclic core. The question is: are there any measurable metrics that might suggest a rationale for replacing the existing core with some other heterocycle? In other words, do we have something in our disposal which is less Edisonian than “screen baby, screen”? I was really intrigued by a statement made by Wermuth in his MedChemComm paper. This article praises the virtues of pyridazines in medicinal chemistry (I am not going into that whole “privileged” business…). It turns out that for the particular biological application considered in this reference (biology is beyond the point tonight), the most potent cousins of the pyridazine-containing compound contained thiadiazole and 1,2,4-diazine rings, which are curiously close in their boiling points. The less potent derivatives contain pyrimidine and pyrazine, which also boil close to each other. The lesson here is that a boiling point reflects a dipole moment, which is an excellent comparative metric. This paper also reminded me about an awesome equation you can see below. This simple math relates melting point to lipophilicity and aqueous solubility. I think this is a great way to estimate solubility of molecules for which the melting point and lipophilicity data are available. I was out of town over the past two weeks, which explains the absence of blog posts. I am now trying to get back into my usual rhythm. Tonight I want to talk about some fine lines in chemistry or, more accurately, some “blurred boundaries”. An interesting essay came out in Nature not too long ago. My co-worker Conor Scully brought it to my attention: http://www.nature.com/news/chemistry-chemical-con-artists-foil-drug-discovery-1.15991. In this paper, the authors lamented about scaffold promiscuity in drug discovery. Promiscuity arises when a molecule interacts with many targets, which may lead to manageable polypharmacology in the best case and total mess in the worst. There are many reasons for particularly terrible outcomes and they range from compound aggregation to metal ion sequestration and covalent protein modification. Covalent inhibitors are the most common culprits, but there are many non-covalent “offenders”, such as 2-aminothiazole. In fact, it was Diego Diaz, my PhD student, who started today’s discussion at our journal club by pointing out the dark side of 2-aminothiazole: http://pubs.acs.org/doi/full/10.1021/jm501402x. Here is my problem with all of this: as I peruse these papers, I cannot help but recall the concept of a privileged scaffold. Snyder and co-workers did a nice job describing this notion some time ago: http://www.sciencedirect.com/science/article/pii/S1367593110000232. By definition, a privileged scaffold is expected to interact with many targets, which allows synthetic chemists to write long-winded intros in their methodology papers. These opuses speak to the projected veracity of developing a new method of making some trisubstituted pyridine (or whatever else). But hold on, my friends. I sense a bit of a conflict: a molecule that interacts with too many targets can be “trashed” for its promiscuity, yet the same molecule can appear in the “privileged scaffold” cohort. This is some double standard. How many times have I heard this: “Had aspirin been discovered today, it would never have been approved”? I think that anyone who gets into reminiscing about the “good old days” knows what I am talking about. Every medicinal chemist pulls this story out and I am actually getting a bit tired of hearing it. Still, there is this undeniable scientific fact that aspirin has its share of troubles when it comes to side effects. It is also a quantifiable fact: COX-2 is aspirin’s biochemical target, but aspirin it not selective and hits COX-1 between 10 and 100-fold more efficiently. The trouble is that COX-2 is a legitimate inflammation target, whereas COX-1 is involved in gastric protection. The difference in the reactions between aspirin and these two enzymes apparently comes from the kinetics of the irreversible step. Zhang and co-workers of NYU recently published a computational study that sheds some light on the observed lack of selectivity. It was interesting to read that the fundamental difference between inhibiting the two enzymes comes from the rate difference of covalent bond formation. Aspirin is a covalent inhibitor and serves as a reminder to anyone who doubts that covalent inhibitors make good therapeutics. I am not sure that the insights one gains out of this paper are going to result in a better aspirin, but who knows – maybe there will be some bright ideas. Apparently there is something very important in the fact that His513 in COX-1 is mutated into Asp513 in COX-2. The whole topic of how covalent inhibitors work is interesting and partitioning between the non-covalent complex formation and subsequent irreversible step is especially fascinating. 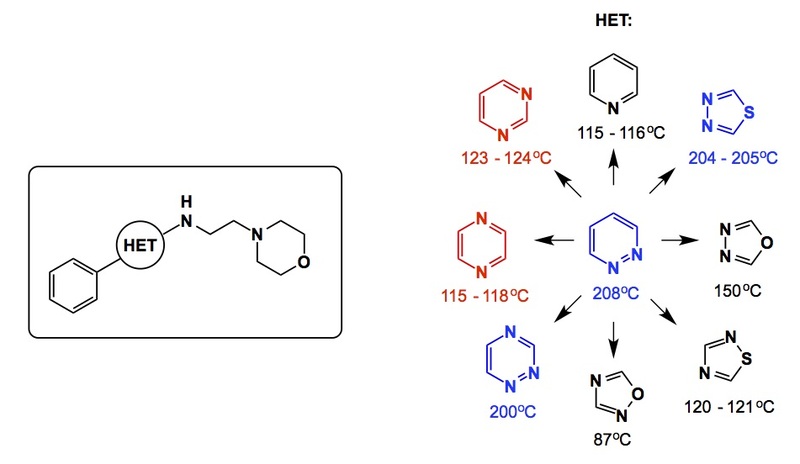 One of the reasons there is hope for selective covalent inhibitors is that we can learn to differentiate between enzyme targets at the first step (pre-complexation) so that attenuated electrophiles do not run amok. Aspirin is clearly not one of the good ones. But we are in 2015, so one can be optimistic about a new generation of “smarter” covalent inhibitors. I was glad to see an Angewandte essay commemorating Kekule’s idea about the structure of benzene (http://onlinelibrary.wiley.com/doi/10.1002/anie.201408034/abstract?campaign=woletoc). This powerful abstraction has been with us for more than 150 years and its foundational nature had invited all manner of follow-up studies that attempted to either confuse or deepen our understanding of aromatic compounds. There is a lot to mention in this regard, and I will focus on one area that was not covered in the Angewandte article – the Mills-Nixon effect. Chemists really struggled with benzene for a long time; the gist of the argument was whether or not Kekule’s structure corresponded to an equilibrating mixture of two cyclotrienes. Pauling’s suggestion of resonance put it all to rest, but for a while the research community was putting forth proposals that substituents on benzene could dramatically affect bonding by shifting the equilibrium... Who can blame them? After all, if there is an equilibrium, Le Chatelier’s principle should apply. The Mills-Nixon effect hails from those days and amounts to a suggestion that annelated benzenes such as the one you see on the right hand side below ought to be cyclohexatriene-like, with double bonds positioned exocyclic to the five-membered rings. All of this later turned out to be wrong – there is no Mills-Nixon effect and experimentally observed differences in bond lengths are much smaller than what is to be expected of a true cyclohexatriene-like structure. Jay Siegel did some really nice work in this regard and you can read about it in the reference below. Coming back to the origins of the Mills-Nixon effect, the same set of arguments (equilibrium or not) later haunted chemistry during the non-classical ion years. Our science is very cyclical and the root causes of all controversies are suspiciously similar. I have a penchant for nucleophilic displacement reactions at heteroatoms. I suppose Prof. Narasaka is to blame for this obsession. I got my first taste of Sn2 pocesses at sp2-hybridized nitrogen about 15 years ago and it left a lasting impression as something that is not readily expected based on conventional wisdom. Tonight’s post is related to this class of processes. It gets even better, though, because the end result of the reaction below is a highly fluorescent molecule. The lead author of the Chem. Eur. 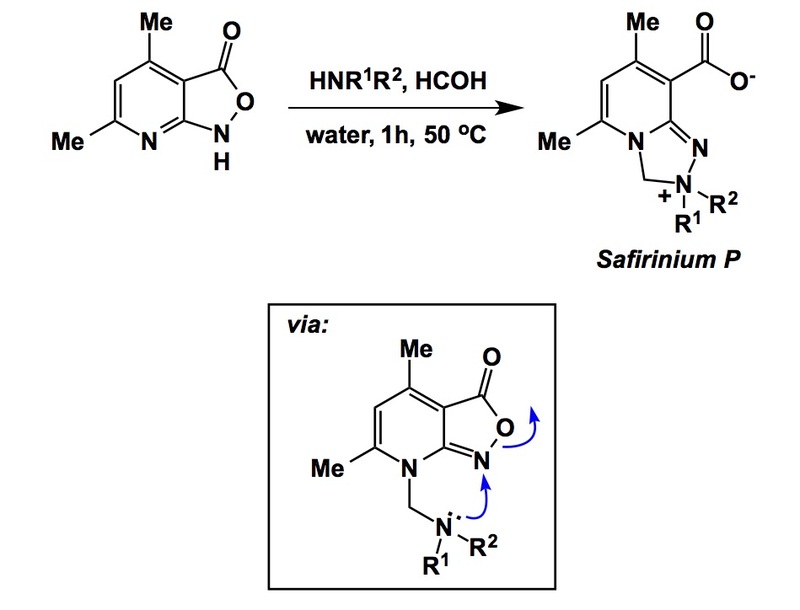 J. paper – Prof. Saczewski of Gdansk, Poland – might not have been interested in obscure Sn2 reactions at nitrogen, but the documented development of a series of neat fluorescent dyes (subbed Safiriniums) shown below, is sure to make Prof. Narasaka happy. The route to a representative Safirinium molecule depicted below involves a sequence wherein a Mannich reaction initially results in the formation of a tertiary amine, which attacks the nitrogen center of the nearby benzoisoxazolone. Someone should look at the energetics of this reaction, paying special attention to rate dependence on the angle of attack. It is probably fun to study kinetics of this process using fluorescence spectroscopy. Oh, and one more thing: the goal of the study reported by Saczewski was to create fluorescent sensors for formaldehyde, upon which the Mannich process hinges. You never know what you’re going to get out of literature these days.